I actually received this sample along with some others due to the extreme kindest of @postmuse. Once you start using this you can see straight away that this is a very deep black. I did notice there was a few hints of grey shading when you look closeup. By the time I had reached stage three in the shading test I couldn’t see much difference between stages two and three. Stage one didn’t look as dark when compared to the other stages. I did find that this ink lays down wetter when compared to Pelikan Brilliant Black. As you can imagine this does effect the drying times. 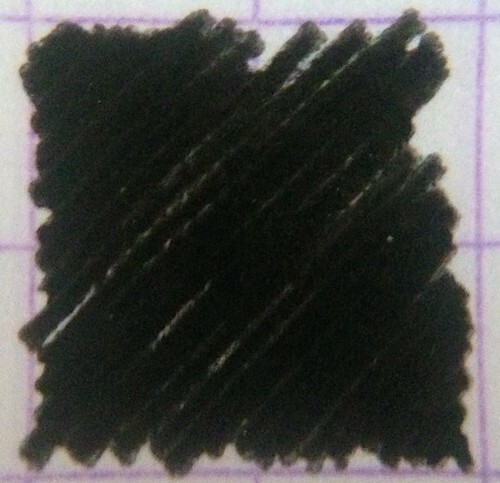 Even at the 15 seconds mark it was still smudging slightly whereas Pelikan Brilliant Black was dry. Only took a few flushes of water before the Safari was running clear. Pretty easy ink to clean out. This is the first Noodlers ink I have used and I have to say I am really impressed. It is a very good ink. One slight issue is that unless you live in america this ink is really hard to source and even when you do it will cost you a lot by the time it gets to you. Drying times aside I would use this as my daily ink of choice if I could source it at a reasonable cost.